Zion Market Research has published a new report titled “Food Processing Equipment Market By Equipment Type (Mixers, Depositors, Refrigeration, Slicers And Dicers, Thermal Equipment, Extruding Machines, And Others) and by Application (Dairy Sector, Fisheries, Meat And Poultry, Fruits And Vegetables, Bakery And Confectionery): Global Industry Perspective, Comprehensive Analysis And Forecast, 2017 – 2024”. 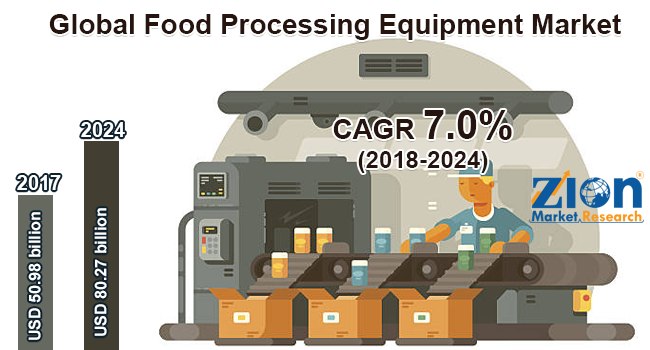 According to the report, the global food processing equipment market was valued at around USD 50.98 billion in 2017 and is expected to reach approximately USD 80.27 billion by 2024, growing at a CAGR of around 7.0% between 2017 and 2024. Global food processing equipment market is primarily driven by changing people’s taste, preference, and food habits growing large consumer base, easily available raw materials, increasing net income of the population, and a broad range of food items. Moreover, rising demand for packaged food products in the developing countries such as China and India with above 1.3 billion population has raised the demand for the food. In addition to this, busy lifestyle and lack of time has increased the dependency on processed food. Thus, rising demand for food has also led to having increased the number of manufacturers in the food & beverage industry, which eventually affects the global food processing equipment market in a positive way. Furthermore, the global food processing equipment market is determined by the other key factor such as growing demand for the dairy, meat & poultry, and seafood products across the world. Besides, raising awareness regarding the safety and quality of food products have led to the increased adoption of the advanced technology and equipment by manufacturers, which are ultimately boosting the global food processing equipment market over the forecast period. For instance, on 1st March 2017, The Bühler Holding AG introduced advanced grain cleaning solution which significantly helps in reducing the mycotoxin levels. Moreover, on 6th March 2018, Marlen International, Inc. introduced new Afoheat, Carruthers, and Unitherm food processing equipment at Anuga FoodTec, Germany. In addition to this, to tap into the emerging market, the key players are focusing on acquisition and merger strategy to maintain its presence all over the world. Thus, the strategic product portfolio will help to gain more share value during the forecast period. Based on the equipment type, the market is segmented into mixers, depositors, refrigeration, slicers and dicers, thermal equipment, extruding machines, and others. Among which, thermal is expected to be the fastest growing segment in the market due to its enormous application in the food industry. Based on the application, the global food processing equipment market is categorized into the dairy sector, fisheries, meat and poultry, fruits and vegetables, bakery and confectionery. Among which, bakery & confectionary segment held a dominant position in the global market throughout the forecast period. Rising demand for easy-to-cook food products and increasing consumption of bakery & confectionary products across the globe is expected to attain significant market share value within the forecast period. By geography, the global food processing equipment market finds its market scope in Europe, North America, Latin America, Asia Pacific, and the Middle East & Africa. The Asia Pacific is expected to be the fastest growing region in the market followed by Europe and North America. The report also includes detailed profiles of key players such as Scherjon, SPX, Maschinenbau Rud Baader, A&B Process Systems, Marlen International, Paul Mueller, Anko Food Machine Company Limited, and Bettcher Industries Incorporated. The detailed description of players includes parameters such as company overview, financial overview, business strategies, and recent developments of the company.